Paul Cunningham Nurses is holding its gala ball with a cava reception, three-course dinner and dancing to Breezin' and the amazing Rob Roberts. There will also be a charity auction and raffle. So what better excuse do you need to dress up and dance the night away? Tickets are €25 from 966 719 115. 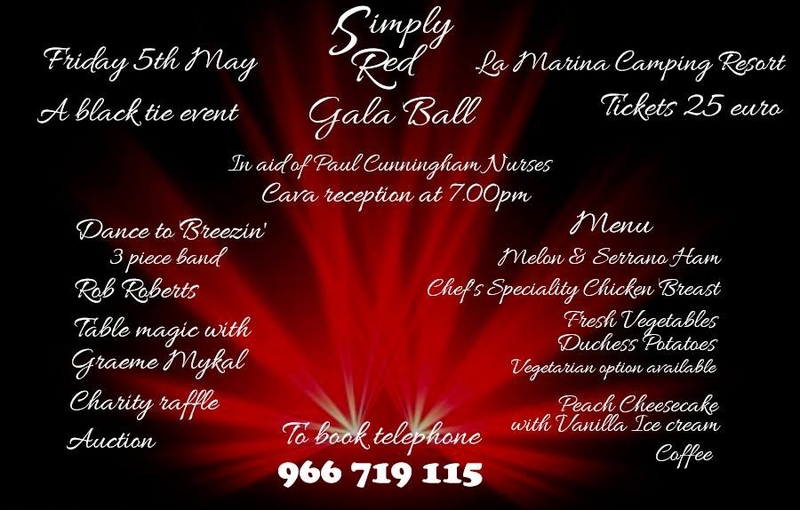 The Simply Red Gala Ball in aid of Paul Cunningham Nurses Charity will be held on Friday 5th May at La Marina Resort. This fabulous black tie event will commence at 7.00 p.m. with a Cava Reception, three course dinner will be served at 8.00 p.m, with Chef's Speciality Chicken Breast and to include coffee. Dancing to Breezin' three piece band and the soulful Rob Roberts. Table magic with the amazing Graeme Mykal. There will be a Charity auction and raffle to complete the evening.